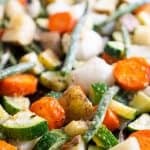 Making oven roasted vegetables is an easy and delicious way to prepare your veggies! It takes only minutes to prep and can be customized hundreds of different ways! Combine all ingredients into a large bowl and mix to coat vegetables. Arrange vegetables in a single layer on a baking sheet. Bake 25-30 minutes until done.